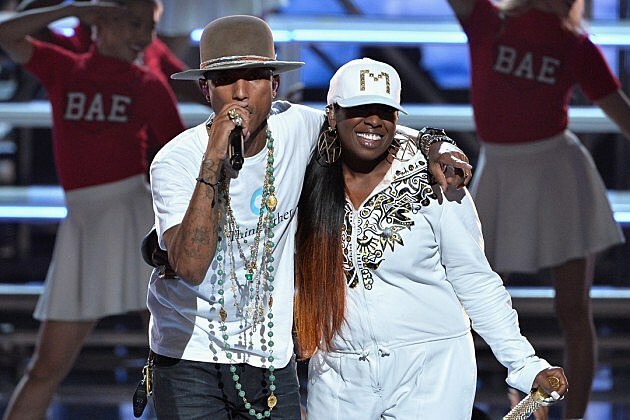 Pharrell is on a mission to revive collaborations of the ‘90’s and we couldn’t be happier. After producing songs on Snoop Dogg’s new album, Bush, and the reassuring track “Alright” on Kendrick Lamar’s critically acclaimed sophomore effort, To Pimp a Butterfly, Skateboard P recently announced he is working with another one of hip-hop’s greats. The super producer stopped by The Tonight Show Starring Jimmy Fallon on Wednesday (April 1) and confirmed he is in fact working on Missy Elliott’s new album. “The way her mind works, like we’re in the studio, just the things that she says, and thinks about. And her video concepts, like I didn’t know all those video concepts were hers. I’m so proud of her. That’s Virginia,” Pharrell states. This is great news for Elliott fans who have been waiting for a follow-up to 2005’s The Cookbook for a decade. The Grammy Award-winning rapper’s seventh studio album looks like it’s coming soon. The project will most likely feature work with Timbaland as well. The longtime collaborators recently hit the studio and shared the experience with their fans in a photo.